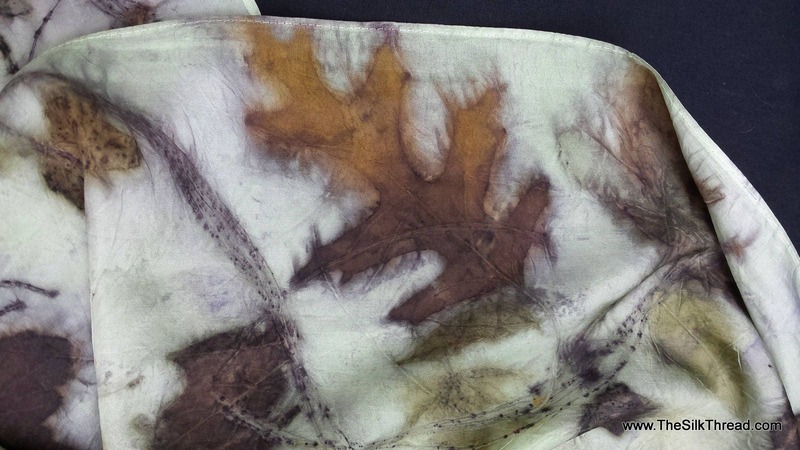 Pale green Silk Scarf, eco-printed with maple, rose and oak leaves by artist, all natural, sustainable, renewable fashion art, 8" x 72"
This is an eco-printed or botanically printed one of a kind silk scarf with a beautiful bold design from maple, rose and oak leaves enriched with a natural dye that, hard to see digitally , is a very pale green! The striking combination of natural colors of copper, green, golds and bronze pop from the surface design. The scarf is 8" x 72" pure silk. My all natural technique creates detailed shapes and colors of the actual plant matter that I use.